Not to be confused with Rakia. For other uses, see Raki (disambiguation). Raki or rakı (/rɑːˈkiː/, /rɑːˈkuː/, /rɑːˈkɜːr/, Turkish pronunciation: [ɾaˈkɯ]) is a sweetened, often anise-flavoured, alcoholic drink that is popular in Albania, Turkic countries, Turkey, Greek Islands and in the Balkan countries as an apéritif. It is often served with seafood or meze. It is comparable to several other alcoholic beverages available around the Mediterranean and the Middle East, e.g. pastis, ouzo, sambuca, arak and aguardiente. In Crete tsikoudia is a pomace brandy that is sometimes called rakı but made from grapes. It is used to make rakomelo which is flavored with honey and cinnamon. (Rakomelo is served warm during winter months). The term raki entered English from Turkish rakı. The Arabic word arak (Arabic عرق [ʕaraq]), means distilled, other variants being araka, araki, ariki. In the Ottoman Empire, until the 19th century, meyhanes run by Rûm (Greeks) and Albanians would mainly serve wine along with meze, due to religious restrictions imposed by various sultans. Although there were many Muslims among meyhane attendants, the authorities could, at times, prosecute them. [original research?] With the relatively liberal atmosphere of the Tanzimat period (1839–1876), meyhane attendance among Muslims rose considerably, and raki became a favorite among meyhane-goers. By the end of the century, raki took its current standard form and its consumption surpassed that of wine. During this period, rakı was produced by distillation of grapes pomace (cibre) obtained during wine fermentation. When the amount of pomace was not sufficient, alcohol imported from Europe would be added. If aniseed was not added, it would take the name düz rakı ("straight rakı"), whereas rakı prepared with the addition of gum mastic was named sakız rakısı (gum rakı) or mastikha. Today, with increased competition from the private sector, and the privatization of Tekel in 2004, several new brands and types of raki have emerged, each with its own distinct composition and production method, although the overall qualities of the drink have generally been kept consistent. These include Efe Rakı, Çilingir Rakı, Mercan Rakı, Fasıl Rakı, Burgaz Rakı, Ata Rakı, and Anadolu Rakı. Sarı Zeybek Rakısı, another recent brand, is aged in oak casks, which gives it a distinctive golden colour. Raki is traditionally produced from raisin/grape spirit called suma that is distilled to a maximum of 94.55% abv, This spirit is not highly rectified spirit and unlike other flavored spirits Raki producers consider that the suma has an important role to play in the flavor of Raki itself. The suma, or suma mixed with highly rectified spirit, is diluted with water re-distilled with aniseed and the spirit is collected at around 79-80% abv. The flavored distillate is diluted and sweetened and rested for minimum of 30 days prior to sale in order to allow the flavors to harmonize. In Turkey, rakı is the national drink and is traditionally consumed with chilled water on the side or partly mixed with chilled water, according to personal preference. Rakı is rarely consumed without the addition of water. Ice cubes are often added. Dilution with water causes rakı to turn a milky-white colour, similar to the louche of absinthe. This phenomenon has resulted in the drink being popularly referred to aslan sütü ("lion's milk"). Since aslan ("lion") is a Turkish colloquial metaphor for a strong, courageous man, this gives the term a meaning close to "the milk for the strong." 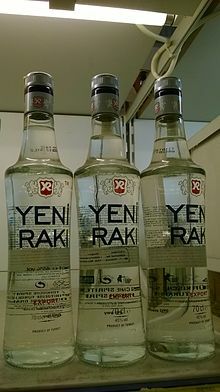 The best-known and popular brands of rakı, however, remain Yeni Rakı, originally produced by Tekel, which transferred production rights to Mey Alkol upon the 2004 privatization of Tekel, and Tekirdağ Rakısı from the region of Tekirdağ, which is famous for its characteristic flavour, believed to be due to the artesian waters of Çorlu used in its production. Yeni Rakı has an alcohol content of 45% and 1.5 grams of aniseed per liter; Tekirdağ Rakısı is 45% ABV and has 1.7 grams of aniseed per liter. There are also two top-quality brands called Kulüp Rakısı and Altınbaş, each with 50% ABV. Dip rakısı ("bottom rakı") is the rakı that remains in the bottom of the tanks during production. Bottom rakı is thought to best capture the dense aroma and flavour of the spirit, and is also called özel rakı ("special raki"). It is not generally available commercially; instead, rakı factories reserve it as a prestigious gift for large clients. Aniseed-flavoured Rakı, has been celebrated as a festival in Adana and Northern Cyprus since 2010. World Rakı Festival in Adana, emerged from a hundred-year tradition of enjoying Adana kebab, with liver, şalgam and rakı. The event turned into a nationwide popular street festival, street musicians playing drums and zurna, entertain visitors all night long at the second Saturday night of every December. North Cyprus Rakı Festival is a week long festival taking place in Girne, Lefkoşa and Gazi Magosa. In Crete tsikoudia is a pomace brandy that is sometimes called rakı but made from grapes. It is used to make rakomelo, which is flavored with honey and cinnamon and is served warm during winter months. ^ "raki." The American Heritage Dictionary of the English Language, Fourth Edition. Houghton Mifflin Company, 2004. 2 September 2009. ^ "rakı" (in Turkish). Archived from the original on 15 July 2014. Retrieved 13 July 2014. ^ "Traditional Turkish Drinks"". Archived from the original on 15 September 2008. ^ "Get Cooking, Fine Living Fans!". Cooking channel. Archived from the original on 2009-09-12. Retrieved 2011-07-21. ^ "Rakıcılar bir kez daha "Dünya Rakı Günü"nde buluşuyor". CNN Türk (in Turkish). 27 November 2014. ^ "Kıbrıs Rakı Festivali". www.kibrisrakifestivali.com (in Turkish). Archived from the original on 2018-08-23. ^ Planet, Lonely; Averbuck, Alexis; Armstrong, Kate; Miller, Korina; Waters, Richard (2016-01-01). Lonely Planet Crete. Lonely Planet. ISBN 978-1-76034-020-9. Wikimedia Commons has media related to Rakı. This page was last edited on 17 April 2019, at 15:06 (UTC).